The IEEE Madras (Chennai) Section is located in Region 10, and was formed on 28 April 1978. It is represented at the IEEE India Council. The Madras Section won the Region 10 "Large Section" recognition award for 2010. 28 October 2009 in DNA India (India): IEEE Senior Member and organizing chair for IEEE WIE CON ’09, Prof. Ramalatha Marimuthu, was interviewed by DNA India’s education correspondent for the daily’s ‘Class Act’ column about women choosing engineering careers. 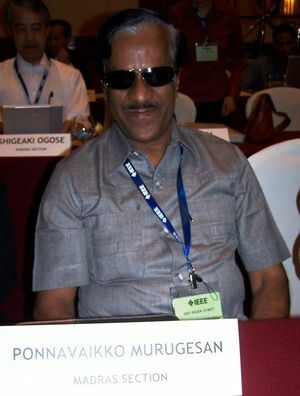 Ponnavaikko Murugesan, Madras Section Chair 2007. This page was last edited on 9 October 2018, at 13:57.